Made using the Goodyear Welt — which means the upper and sole are sewn together in our heat-sealed z-welt stitch. 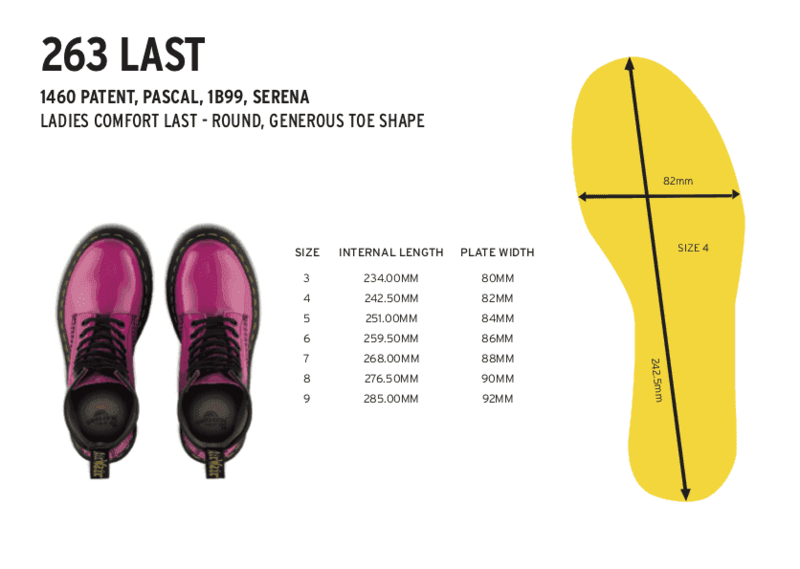 AirWair™ sole, that's oil and fat resistant with good abrasion and slip resistance. Darcy Floral, a circa-90s print from our archives, is reinvigorated with rich, multi-colored blooms against a black leather background. With a soft, hand-painted effect, the pattern effortlessly brings floral from summer to fall — but it's the boot's tough femininity that we love the most. The women's 8-eye Pascal has all the traditional Doc's DNA, like grooved edges, yellow stitching and the classic heel-loop. Built to last, it's made using one of the finest methods of construction: the Goodyear Welt — which means the upper and sole are sewn together in our heat-sealed z-welt stitch. The boot sits on Dr Marten's durable, comfortable AirWair™ sole, that's oil and fat resistant with good abrasion and slip resistance.